Zephyr joined me for the photo session. 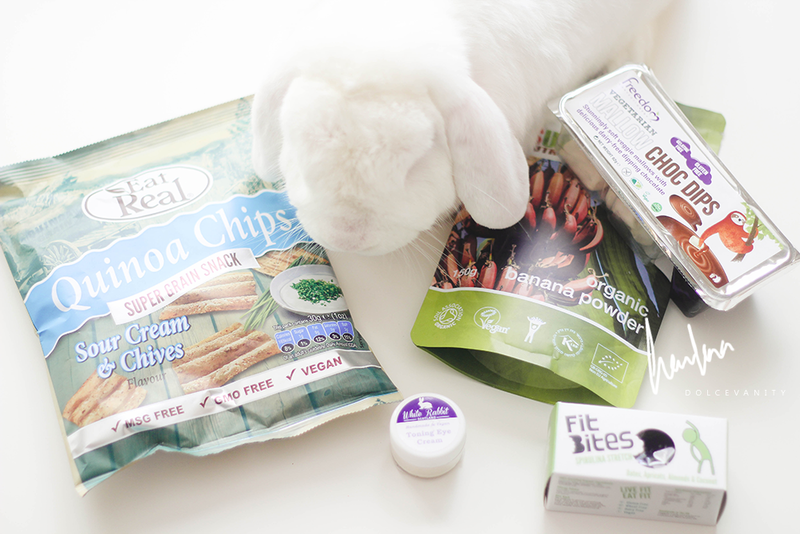 Quite fitting as inside the box was a sample of White Rabbit Skincare Toning Eye Cream.Made by hand this eye cream tightens, firms, reduces eye circles and puffiness and repairs damaged skin. It's packed with antioxidants and vitamins with ingredients such as Green Tea, Rosehip Oil, Sweet Almond Oil and Chamomile and Carrot Seed Essential Oils. CoFresh Sour Cream and Chive Quinoa Chips, these were so delicious and I was gutted when they were finished. Quinoa is said to be a superfood so what a good way to include it than in a nice. I noticed while looking on the website I have seen the brand in Sainsbury's which makes me happy as it's very accessible for me to stock up on. Freedom Mallows Choc Dip, my favourite marshmallows, this brand new product has a dark chocolate dipping sauce and soft and chewy vegan marshmallows to make the perfect combination. Couldn't be faulted. Some of my sauce was stolen to be put on pancakes. FitBites Spirulina Stretch, 2 rolled balls full of 40% Apricots, 38% Medjool dates, 14% Almonds (nuts), 6% Coconut & 2% Spirulina. There are 3 different FitBites flavours, these make nice quick snacks or if you're peckish and want something healthy to nibble on. Supernutrients Banana Powder, what I really like about this is that it can be added to my smoothies which I live for and the Supernutrients website has 16 different superfoods and some I'm interested in trying. I just wish that the website made it easier for ordering as it's not an add to cart but I can inform you that it does retail for £4.00. I'd love to know if you've got any favourite healthy snacks? We sent all the necessary information about Beets Blu heart rate monitor and key finder to your e-mail. Please check it and reply. Having a minor soppy moment about your blog. It's so fierce. I want to learn more about vegan beauty and minimalism. GAH.